In 2008, a card game called Dominion was published, and an entire genre of card games was born. Known as deckbuilders, these games give players a small deck of cards to start with, and allow them to add to and customize their deck each turn. By fine tuning the contents of your deck, you can amass the most points, or defeat or your foes, or, most importantly for us here at Co-Optimus, work together to defeat a common foe. We’ve covered Pathfinder Adventure, Legendary (the original Marvel heroes and the Encounters set), and today we go into deep space with another deckbuilding game: Star Realms. 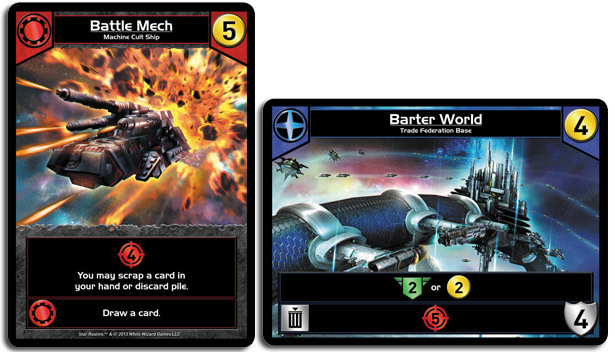 Star Realms sets itself apart from other deckbuilding games in several ways. Many deckbuilding games take quite a while to set up and play through, with a lot of sorting into piles after the game is over. Star Realms takes only a few minutes to set up, and generally less than a half hour to play, depending on the number of players. Just remove the base decks for each player, shuffle the rest of the deck, and lay out five cards, and you are ready to begin. Star Realms is also portable and inexpensive; the box fits in your hand and retails for just $15, and supports two players. Add another base set for each two players. Though the cost, package, and playtime are all less than other deckbuilders, the gameplay experience most certainly is not. There are three basic currencies (for lack of a better term) that players accumulate during the game. 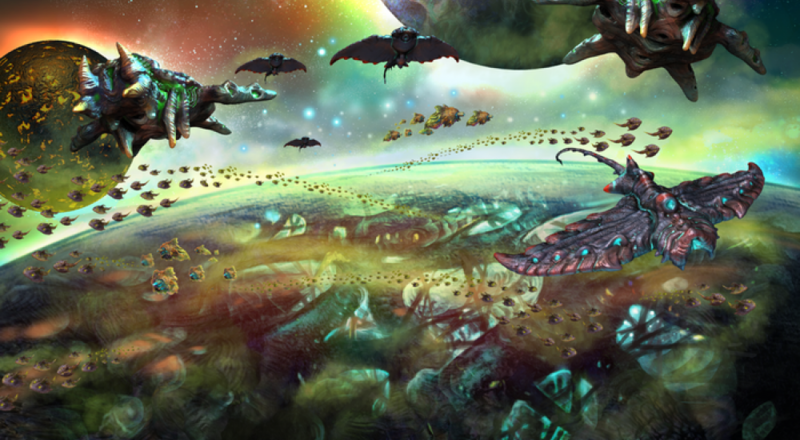 The deck players begin with contains Scouts, which provide Trade, allowing you to purchase new cards, as well as Vipers, which provide Combat, which is needed to attack. Each turn, there are five cards available for players to buy, adding them to their deck. Ship cards provide Trade, Combat, or Authority, which is perhaps the most valuable resource, as when your Authority is reduced to zero, you lose the game. The trade deck also contains Bases, which stay in play from round to round, providing all manner of benefits. All bases have a defense value, and can be attacked. Outposts are a special type of base, providing protection to their owner. Your Outposts must be destroyed before you can be attacked, and if your opponent cannot muster enough Combat to destroy an Outpost, they will be quite unhappy indeed, as you will survive more turns and have the chance to buy ever more powerful cards. These game mechanics are quite simple, and very easy to understand, especially for those with experience playing other deckbuilders. Yet the variety of cards and their interactions provide a deep experience for even veteran gamers. Page created in 0.5952 seconds.